1. Israeli Occupation Forces (IOF) wounded and injured 129 Palestinians, 10 of which where injured with live ammunition, two of them are in serious conditions. Fifty Palestinians were injured in Ramallah, 11 in Bethlehem, 7 in Hebron, 45 in Nablus and 16 in Jenin. Some of these injuries were caused by snipers, once that the IOF spread them in the ongoing confrontations areas. 2. Raids and mass arrests of Palestinian youth in various villages. 3. Four new battalions have been sent to the West Bank by the Israeli military and over 4,000 Israeli occupation policemen and Special Forces have been sent to Jerusalem. They are all heavily deployed on the main roads throughout the Occupied West Bank and at checkpoints in different areas. 4. Ongoing confrontations with the Israeli occupation forces started from noon and went on until midnight in more than 30 different sites in the occupied West Bank and Jerusalem. 5. Clashes with settlers along the main roads at the entrances of the settlements located near Palestinian villages in the Occupied West Bank. 6. Daily incursions at the Al-Aqsa Mosque compound and protests, consequence of the closing of the Old City of Jerusalem to Palestinians, where only those who reside there are allowed in. 7. Palestinians have formed popular committees and commissions of guard in the villages adjacent to settlements and its neighborhoods. 8. The IOF erupted in the house of the martyr Ghassan Abu Jamal Jaabis in Jerusalem. 9. The IOF attacked an ambulance belonging to the Red Crescent. On Tuesday, since dawn until evening, 129 Palestinians citizens were injured by Israeli occupation forces throughout the occupied West Bank and Jerusalem. From those: 10 wounded with live ammunition - two of them in serious conditions - 30 wounded with rubber bullets, while the other Palestinians injured due to suffocation while inhaling tear gas and some others injured because of the brutal IOF physical violence. In Bethlehem, the government hospital received 11 injured with rubber bullets and cases of tear gas suffocation. In Ramallah, the Palestine Medical Ramallah received 9 injured from rubber bullets - including a head injury -, and a serious injury of abdominal insert operations because of the deep penetration of a rubber bullet to the abdominal wall. The PMR also received about 41 injured civilians, including seven citizens from the neighborhood area near Beit El checkpoint and Qalandiya. Dozens of people were suffocated because of tear gas that was thrown towards the mountains. Fortunately, medical sources in Ramallah confirmed that most of the injuries were between medium and minor levels. During the afternoon, the clashes in the occupied West Bank got more intense, when Palestinian youth started throwing molotov cocktails at the israeli military vehicles. One of the Israeli occupation soldiers was wounded during the confrontations on Qalandiya checkpoint, north of Jerusalem. Another IOF soldier was injured during clashes with Palestinians in the town of Tekoa. 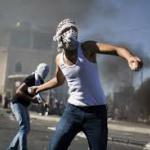 In Jenin, clashes occurred at the Jalama roadblock where two young men were injured. The Israeli occupation forces also detained an ambulance belonging to the Red Crescent Society at the entrance to Anata. Some Palestinian youth were seriously injured in confrontations in the area near by the Shuafat camp. Because of so many injuries, the Palestine Medical Complex Hospital appealed to citizens to donate blood from type A negative and O negative. The IOF snipers were set on the roofs of buildings in the Palestinian town of Silwan in occupied Jerusalem. At the same time, clashes between the occupation forces and Palestinians were taking place in a number of other areas, including the town of Nabi Saleh, west of Ramallah, where Israeli forces sealed off the town gate. Violent clashes also continued in front of the Beit El settlement in Ramallah and in Qalandiya checkpoint, as well as in Bethlehem, Anata, occupied Jerusalem and in central Hebron. In Hebron, around the Tomb of the Patriarchs, the journalist Mohammed Abu was arrested while covering the settlers’ attacks on Palestinians. Clashes also continued in the vicinity of the Geshora factories, in the west of Tulkarem, and in front of the Jenin east crossing, Jalama, where the IOF arrested a business owner selling pottery near the Jalama crossing. They also hit a Palestinian woman from occupied 1948 Palestine while she was passing through Jalama crossing during the confrontations. Earlier during the day, the IOF arrested Hussam Abu Laith, 10 years old, that, fortunately, was later on released. The occupation forces also arrested a Palestinian youth on Tuesday evening under the pretext of trying to stab a soldier at the Za'atara checkpoint, south of Nablus. Dozens of settlers gathered at the entrances to a number of Palestinian towns, including Bani Fadel village, south of Nablus and Tulkarem. They also closed the entrance to a valley in Qana Salfit and broke down a number of cars passing through Sheikh Jarrah in Jerusalem. Dozens of them were gathering in east Qalqilya, backed by a large number of Israeli occupation forces. The IOF ordered the demolition of the houses of the familys of the martyrs Ghassan Abu and Mohammed Aldjaabis, the latter situated on Mount Scopus in occupied Jerusalem. They have also been patrolling the neighborhood of the Hijazi. Meanwhile, the Palestinian National Authority denied what some media said earlier this week, or rather that they were attending meetings with senior officers from the occupation army in order to calm the situation in the occupied West Bank and Jerusalem.